Come down and blow away the hangover, and blame any sickness on the sea state! New Years Day Cup starts at 11.00 and is a 1 hour handicap race. Alternatively come and watch the entertainment. Escape the relations, tell them you are off to the sails. One hour of barging and shouting start at 11.00. Boxing Bay Pennant for the winner. We have decided as a Christmas treat to cancel the January work party. The next Work Party will be on Saturday 7th February. In the mean time, please remember that it is now the winter season so ensure that your boat is secured from high-winds and floods. Have you checked your boat recently? It was a strong wind this morning, about 15 -16 mph from the SW and quite gusty. Jon M set a long beat down to 3 then back along the buoy line to 4 down to 2, across to 5 down to 8 then 6, 7 and back through the start. There were 16 starters which was good considering the brisk wind and David C (Laser) was first back through the start line followed pater JC in another Laser then Newton & Roz in the Laser 2000 with Ian C (Supernova) close on their heels. Paul R (Aero) came through next in 5th place followed by Steve & Lynn in the 505 (nice to see you back on the water Lynn). The next group was the mid-fleet Laser pack who enjoyed a terrific scrap all through the race, led initially by Simon B followed by Mike A, Dave L, Dave P and Curtis. There was a slight gap back to Hadey who was going well with her 4.7 rig (some of the others were wishing they had the same rig!). Hadey was closely chased by Rod B (Laser) then further back was the sole Solo of Mike C just ahead of Hugh (Byte) with Paul D (Radial), who was persevering well in the challenging conditions. At the end of the second lap the Laser Cs were keeping it in the family and still leading, but Ian had nipped in front of Newton & Roz with Paul R and Steve & Lynn still running 5th and 6th. The leader of the Laser pack was now Dave L and Dave P had slipped to the rear by virtue of just touching Dave L’s boom at No 5 and having to do penalty turns, at the same time taking Mike A down the lake with him! Further back Rod B had got past Hadey and Hugh was practising capsize drills. By the end of the third lap Paul R had gained three places to move up to 2nd behind David C with Jon C 3rd and Ian 4th trying to shake off Newton & Roz with Steve & Lynn not far behind them. Dave L and Mike A were leading the midfield Lasers and Dave P had gained two places to move up to 9th. Curtis came to grief on this lap inverting his Laser and impaling the mast in the mud, so it was an early bath for him (literally). Rod B also capsized gybing round No 6 allowing Hadey and Hugh to slip past him. Having led from start to finish David C came through the line to take victory with Paul R a little behind in 2nd , but Ian had moved up to take 3rd with Newton & Roz 4th and Jon C 5th. Dave L took the honours in the midfield battle, but Simon B retired presumably capsized (but not sure of this). Hugh also retired after a quadruple capsize! Mike A also capsized by pulling the boat over on to himself (difficult to do in these windy conditions), the end of his boom got embedded in the mud and by the time he got going again he had been passed by the whole of the fleet. Rod had made up two places and crossed the line in 9th. In sight of the finish Mike C capsized gybing round No 8 allowing Mike A to get past him on the water. The final positions on the water were 1st David C, 2nd Paul R, 3rd Ian C, but on handicap Ian will probably be pipped by Newton & Roz. Hadey sailed well and by not capsizing will probably take 6th place on handicap. Paul D did well to keep going and get a finish. It was considered that we should have a capsize league as well as a normal leader board but as with all sailing procedures there are numerous complications. It looked as if Hugh would take the capsize honours with 6, then Ian C and Jon C with 4, Mike C with 2½ (what’s half a capsize ! ), Paul D 2, then Simon B, Rod B, Curtis and Mike A with 1 each., but then along came Paul R with “too numerous to count”. It then turned out that Hugh had 3 separate capsizes but the last of these was a quadruple capsize. Now does this count more or less than four separate capsizes and does a capsize to windward count more than a “dry” capsize to leeward? 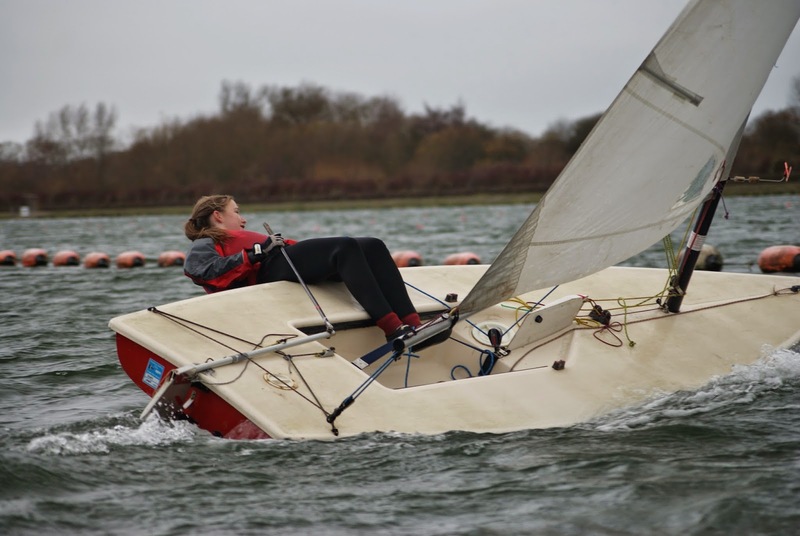 Also does a capsize resulting in a retirement count more than one which just results in a time loss. 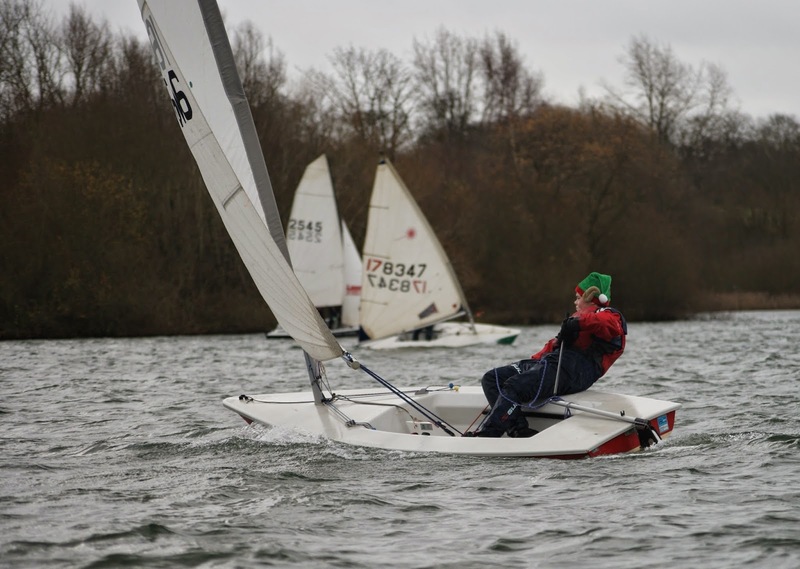 Ian was using his capsizes as part of his normal technique for gybing around 4, so should he be penalised for improper capsizes ?, Sally suffered a virtual capsize – she thought she might capsize if she went out so kindly volunteered to prepare soup and rolls. This probably counts less than an actual capsize but definitely deserves bonus points. Hadey, Dave P, Steve & Lynn and David C did not capsize at all and probably should be disqualified for this. David C said that he would have capsized, but could not see the capsize flag so considered that he was not entitled to do so. We may have to rewrite the rules to sort this issue out. Have a Happy Christmas and best wishes for 2015. After the excitement of a lively AGM it was back to the sailing, but first a big THANK YOU to all the members of the Committee and the organisers and helpers for the Monday Oppies, Wednesday Suppers, Thursday Pirates and Saturday Pinkies. We appreciate your hard work and commitment on behalf of the club members. With quite a brisk SW wind, about 12 mph but gusty, Adrian set the first beat to X, which was hidden around the back of the island, about where No 1 was usually to be found. There were 16 starters and some elected to stay out wide and some decided to go between the bank and the island. The latter group seemed to fare slightly better on the first lap. turning left up to 5, then across to 7 and back through the start. Good idea to write this one down! At the end of the first lap Paul R (Aero) wearing a jaunty piratical head scarf was in the lead followed by David and Jon C (Lasers) and then Ian C (Supernova), Karen (Laser) and Newton & Ellen (Laser 2000). Then there was a slight gap back to James P (Laser) and then a larger gap back to Dave P, Dave L and Mike A (Lasers) and an even larger gap back to Hadey (4.7). Peter R was next, but not surprisingly was struggling to hold his Enterprise sailing single handed. (It is rumoured that a change in the racing rules is being considered for next year to allow single handed sailors to use their other hand as well !). Quite a way behind Peter came Alistair S (Laser), William P (Topper) and Steve P trying to cope with the somewhat cramped conditions in a Laser compared to his usual Titanic. Unfortunately Sally came to grief on the first lap and had to be retrieved by the rescue boys. By the end of the second lap Paul and David C had pulled a slight lead on Ian and Karen in 3rd and 4th places with Newton & Ellen battling with Jon for 5th place. James had capsized gybing round 5 and got tangled in the buoy line and Dave P had capsized going back towards X, this had let Mike A and Dave L through, but then Dave L was hit by a gust after gybing round 8 and he capsized, letting Mike up to 7th with Dave P retaking Dave L to 8th. Peter R decided to retire on this lap, but Hadey, Alistair and Steve were still plugging away and William was given the gun at the end of this lap. The three leaders were in the same positions at the end of the third lap, but Karen had retired as she needed to get away early to start her annual winter migration to the ski slopes. Jon had squeezed past Newton & Ellen to take 4th place. There was a terrific tussle going on between Mike A, Dave L and Dave P in 6th, 7th and 8th places with James P starting to make up ground (should be water) on them in 9th place. Hadey was in a clear 10th place and Steve had managed to catch and pass Alistair, who had suffered a triple capsize and these were finished at the end of this lap (in more ways than one). At the end of the fourth and final lap Paul was first across the line with David C slightly behind him with Ian slightly further back in 3rd. Jon managed to hold Newton & Ellen off to take 4th. Dave P won the scrap behind moving up from 8th to 6th, with Dave L 7th, Mike A 8th and James P 9th. It was a really good race with an interesting course, good wind and close racing throughout the fleet. The final positions on the water were 1st Paul, 2nd David C, 3rd Ian C, but on handicap it will be David first with Paul second and Newton & Ellen third. Well after two light wind weeks the wind finally arrived and was 14 mph, slightly gusty and from the West. David C set the first mark to 3P followed by 2P 4S 9P 5S 8P X S , X was placed straight out from the jetty half way across and the start was from Tektona. Some of the Lasers decided to go for radials (Karen and Curtis), Sally (Comet) and Peter R (Enterprise) both rigged but Peter thought it was on the edge for a single handed and Sally and Peter decided at the last minute to go together in the Ent – good move. Chris A and Alistair S signed on, but decided it was a better plan to watch rather than swim ! At the launch the wind got up a bit more and was a lot gustier. Forecast was for 25mph gusts and that was probably right. A couple of boats capsized before the start including Ian C (Supernova). At the first mark Karen was leading from Peter R & Sally then Newton & Roz (Laser 2000) then Peter S (Byte). By the second mark it was still Karen ahead followed by Newton & Roz, then Peter R & Sally. As Karen rounded 2 a gust hit her and she capsized, but recovered quickly leaving Newton & Roz in the lead. 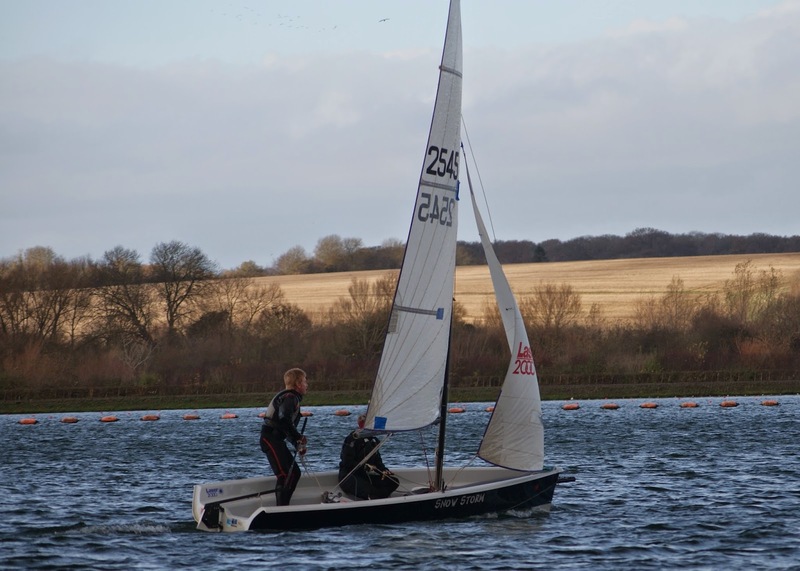 Peter R & Sally hit 5 and then had trouble doing the penalty turn in the gusty conditions, and lost a lot of time. This allowed the Lasers of Dave P, Dave L, Curtis and Rod B to move up to 3rd to 6th places respectively. Ian recovering from his capsize at the start was battling with Adrian (Laser) for 7th place. Mike C (Solo) was 10th behind Peter & Sally with Peter S bringing up the rear having lost a lot of time on the first lap and may have capsized? Sylvia must have capsized on her way to 9 on the first lap and got parted from her boat that started to get blown away. The rescue boat plucked her out. At the end of the third lap Newton & Roz were still leading, but Ian was now up to 2nd with Dave L 3rd and Dave P had moved up to 4th. The first three remained unchanged at the end of lap four, but now Adrian had taken 4th with Dave P 5th and Rod B up to 6th. This group of Lasers was having a terrific scrap just behind the leading three boats. 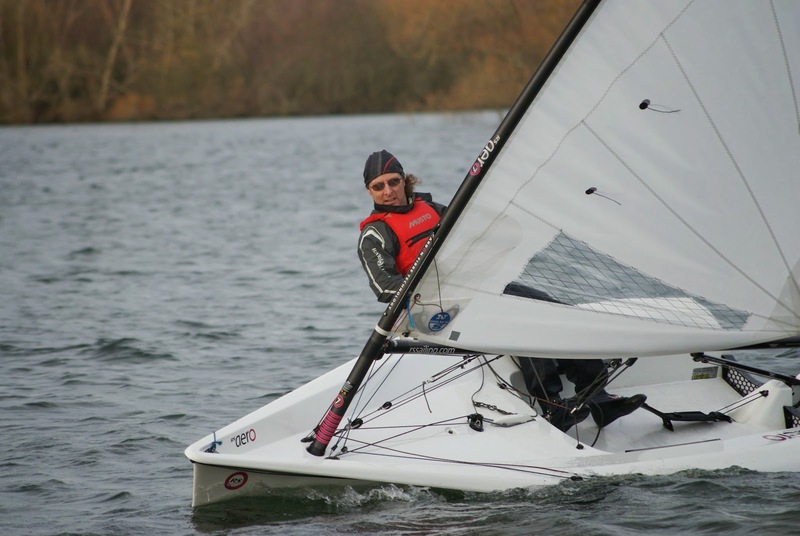 The fifth and final lap saw no change in position throughout the fleet, but with the wind steadying slightly Ian had started to catch Newton & Roz but they managed to hold him off and crossed the line just 4 seconds ahead. The final positions on the water were 1st Newton & Roz, 2nd Ian C, 3rd Dave L.
The only change in position due to handicap was Peter & Sally gaining one place to push Curtis down to 8th, however it should be noted that Curtis is now the series leader. Please remember to attend our AGM on Thursday. Details are below including some pre-meeting information relating to items the membership will be asked to vote on.